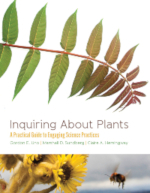 With your generous donation of $30 or more today, we would like to send you a complimentary print copy of Inquiring about Plants: A Practical Guide to Engaging Science Practices. This important step-by-step resource was developed for science teachers to help create a culture of inquiry in their classrooms If you would like to receive a copy of this helpful guide please provide us with your mailing address with your donation. It also makes a perfect gift for your favorite science teacher! Your tax-deductible gift makes all of the difference. Your generosity today goes directly toward equipping our teachers and students in the uphill battle to improve science education and understanding. Please call 314-577-9504 Monday through Friday 9:00 a.m. - 5:00 p.m.
You will be asked to supply the same information requested when donating online.